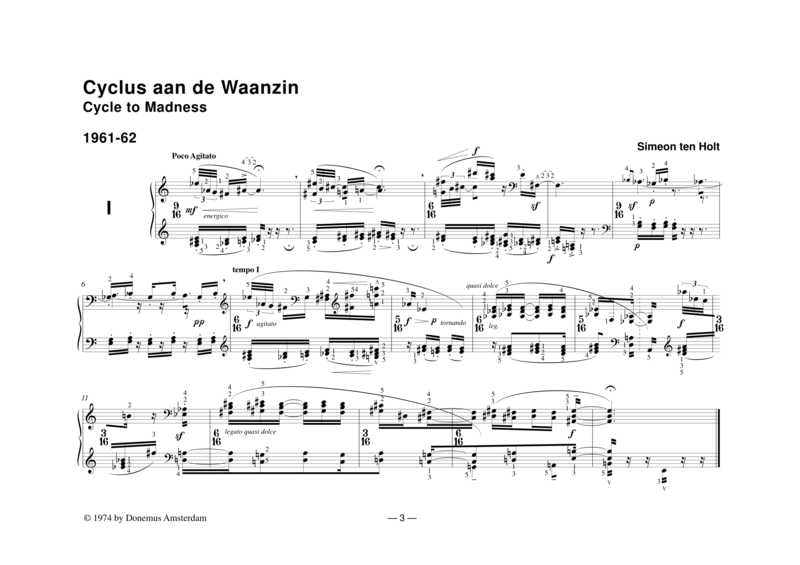 This is series of thirty compositions subdivided into three parts of ten pieces. 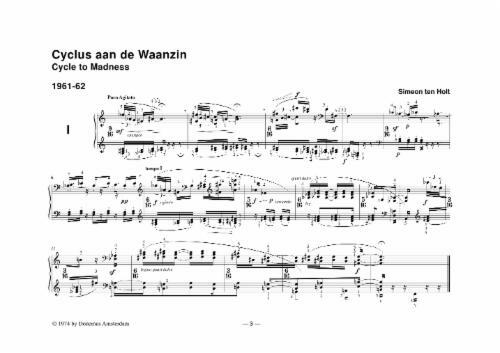 Initially these parts were subtitled: VRIJ-zinnig, WEER-zinnig and WAAN-zinnig piano boek. In the publication these subtitles have been left out. The subdivision though has been maintained. The titles of the separate pieces in part three have been maintained. The cycle is considered to have been born from the relation modality of stage III. The subject starts moving and leaves its position. The embracement of the object becomes a confession and a declaration of principles. The tonal centre gives way to preponderant a-tonality and a further manifestation of chromaticism. Stronger than in the Bagatellen and other previous works of this kind, process-oriented activity occurs in this case. From static ‘inclusion’ of the content, the format changes into ‘opening up’. The composition is the expression of a handful of something that can never be grasped in its entirety. The effort in itself is emphasised and the result is a kind of error regarding something that is directed by a blind impulse. The composition can never be looked upon as an accomplished effort and the attention regarding its aim is bigger than the size of the result can accommodate. Cinders from a process, a random picture taken during a trip that was not started because of the pictures, but because of reaching the aim (the parts of the cycle show mutual relationship as far as they are the description of the distance travelled, a covered lap of a certain orientation). Intuition, intellect, feeling and will are the corner stones of an open procedure, the essence of which is determined by the ‘intangibility’ of the ‘emotion’. The sequence of thirty short pieces (the number is irrelevant and varies between two and the number n) is the collection of a number of grasps = errors, regarding something that remains inconceivable and cannot be grasped, eventually resulting in Insanity. In the space between the act of grasping and the awareness that this cannot be grasped, we find the element of magic and charm. All parts merely contain emptiness – the distance that is gaping between grasping and the impossibility to get hold of. The question about aesthetic charm is not asked. Each random arrangement seems to be incompatible with the open space that has been reserved for chance. The short time span of the part, per definition a result of the failure, also refers to the incantation, to the ritual aspect of the Cycle in its tonality. The ritual is not focussed on demanding favours from the Gods of the cosmic powers, but on the power of the unruliness of the human identity. This unruliness, however, appears to be unchangeable for the time being. The spell of the conditioning process of tonality, of the inclusive power of the system, of the deeply rooted engagement framework aimed at the subjects, cannot be broken as it seems. The tonal element hovers as a spectre through the Cycle and offers, either in the open, or disguised, the bill of an unpaid debt.